In the absence of concerted international pressure on Turkey to rein in Erdogan’s authoritarianism, the only plausible outcome is further violence. The political situation in Turkey continues to deteriorate in the wake of the attempted coup d’état in July 2016, allegedly organized by the Gülen Movement, a former ally of the ruling Justice and Development Party (AKP). It has in fact led to a slow incremental counter-coup where Erdogan and his cronies have progressively jailed, marginalized and silenced opponents of all hues — but especially the Kurdish movement. The botched coup has conceded the Erdogan regime the pretext to arrest 80,000 suspects, 40,000 of whom remain in custody, while forcing the shutdown of more than 150 publications, the firing of more than 100,000 civil servants and the re-staffing of the army’s upper echelons with Erdogan loyalists. It has also furnished Erdogan with the opportunity to eradicate his principal political opponent, the pro-Kurdish, leftist People’s Democratic Party (HDP), which had been hindering his assumption of complete parliamentary control. Erdogan’s campaign culminated in the arrest of twelve HDP MPs, including its co-chairs Selahattin Demirtas and Figen Yüksekdag last Friday. The HDP had no role in the coup attempt. The party immediately repudiated the coup — it was even commended for its stance at the time by Erdogan’s puppet Prime Minister, Binali Yildirim. In spite of Erdogan’s calculated sabotage in 2015 of the peace process, which had been intended to bring an end to the conflict between the Kurdish Workers’ Party (PKK) and the Turkish state, there was no Kurdish support for the 2016 coup. Indeed, many of the senior military figures who have subsequently been unveiled as the coup’s instigators were directly involved in the brutal counter-insurgency in Kurdistan in the recent past. Nonetheless, since July, the Erdogan regime has used emergency rule legislation to relentlessly target all elements of the pro-Kurdish political spectrum. A range of municipally-funded grassroots cooperatives have had all financial support stopped. Language schools were shut down and 1,000 Kurdish teachers were fired. Even Zarok TV, a Kurdish language TV station for children, was closed. In September, the government passed a decree that dismissed 28 municipal governments and replaced them with directly appointed trustee governors. Twenty-four of the 28 municipalities were in Kurdistan and under the control of the HDP’s local sister party, the DBP. Currently, around thirty elected Kurdish mayors are in prison and a further seventy have been fired. This blatant interference in local governance overrode the democratically expressed wishes of the millions of Kurds and other ethnic and religious minorities in Kurdistan that voted for their municipal authorities. In October, the co-mayors of Diyarbakir Gultan Kisanak and Firat Anli were arrested on multiple trumped-up charges, including facilitating the return of Kurdish guerrillas’ bodies for burial. However, the arrest of the high-profile and internationally recognised HDP leadership is a marked escalation by the Turkish government. It does admittedly follow in Turkey’s notorious tradition of both legal and extra-legal victimization of the Kurdish parliamentary party since the 1990s. Violence against the HDP and its supporters peaked in the summer 2015 when the party passed the 10 percent electoral threshold for the first time to take its place in the Turkish parliament. Its presence in parliament denied Erdogan the possibility of the overall majority required to amend the constitution to transform the Turkish government into a presidential system, wherein he would personally have hugely enhanced powers at the expense of the assembly. 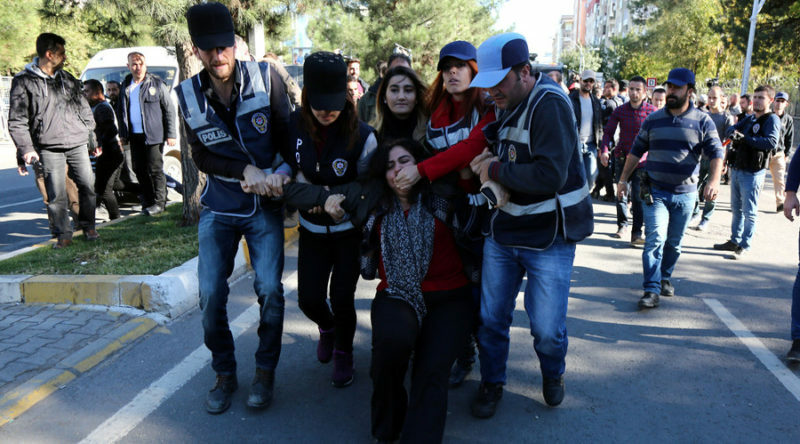 A report by Turkish human rights organization IHD confirmed that 114 attacks were conducted against the HDP in the lead-up to the June election, resulting in 47 injuries. There was also an ISIS bombing of a HDP rally in Diyarbakir, which killed three party supporters and injured hundreds. The violence intensified after the election with a series of ISIS bomb attacks against the HDP in Suruc and Ankara, which resulted in huge casualties. Although, it remains to be confirmed, there are strong grounds for suspicion that elements within the Turkish security forces colluded with ISIS or at least had forewarning of these attacks. Furthermore, in autumn 2015, the Turkish security forces launched a huge military campaign to dislodge Kurdish youths affiliated to the PKK from a number of Kurdish city centers. The campaign resulted in hundreds of civilian deaths and the destruction of a number of historic and culturally symbolic Kurdish city centers. The imprisonment of the HDP deputies should be seen as a continuation of Erdogan’s anti-Kurdish campaign, and will lead to the almost certain proscription of the party overall. Given the electoral balance of power in Kurdistan, it is evident that the AKP will obtain the ousted HDP’s seats allowing the AKP, with the potential support of the far-right MHP, to realize their vision of a reconfigured governmental structure, headed inevitably by Erdogan. Aside from the domestic political developments, there is also a regional aspect to Erdogan’s strategy. Turkey has recently intervened in the Syrian civil war, ostensibly targeting ISIS but in reality dedicating all its efforts to combating the Syrian Defense Forces forces, aligned to the PKK’s sister party in Syria, the Democratic Union Party (PYD). Turkish forces have bombarded Kurdish positions in Syria and are evidently concerned with maintaining the Jarablus corridor, which prevents territorial contiguity between the three Kurdish cantons ruled by the Kurdish movement and its local allies in Rojava. Turkey’s increasing military belligerence is rooted in a policy shift that favors the taking of pre-emptive action outside of Turkey’s borders to protect its self-defined interests. It has already launched Euphrates Shield to weaken the Kurds in Syria and is currently positioning itself to engage more broadly to “protect” Sunni and Turkmen in Mosul. The campaign against the Kurds outside Turkey’s borders must be considered as part of a regional anti-Kurdish strategy which targets not only the armed PKK and PYD but also the parliamentary Kurdish representatives. It remains to be seen how the Kurdish movement will respond to these recent developments. On November 4, a suicide bomb attack was launched against a police building where many of the HDP deputies had been detained. Two of them, Figen Yüksekdag and Ankara deputy Sırrı Süreyya Önder, were actually in the building at the time of the attack, and local DBP politician Recai Altay was fatally wounded. The bombing was claimed by ISIS (interestingly, they have not publicly claimed any of its previous attacks within Turkey). The HDP immediately issued a statement demanding that the police release all information regarding the attack. At the very least, it seems to have been a remarkable coincidence that an ISIS bomber would target this particular building shortly after some of the HDP’s most prominent politicians were held there. To add to the confusion, a PKK splinter group named TAK has also claimed the attack and apologized for Altay’s death. Aside from this bombing, there has not been a marked upsurge in violence — but with the closure of any institutional political avenues it seems only a question of time before Kurdish political frustrations are channelled toward the PKK and its armed forces. Despite everything, they can’t consume our hope, or break our resistance. Whether in prison or not, the HDP and us, we are still Turkey’s only option for to freedom and democracy. And that’s why they are so afraid of us. Do not, not a single one of you, allow yourself to be demoralized, do not drop your guard, do not weaken your resistance. Do not forget that this hatred and aggression is rooted in fear. Love and courage will definitely win. Her courage and hopefulness can only be admired, but without prospects of any peaceful stabilization of the conflict, it would be unrealistic to speak of resolution at this stage. As the respected Turkish intellectual Cengiz Candar put it, “with what happened in the last week, Turkey is steadily moving on the road to fascism.” It seems that an EU associate member and NATO member is heading toward outright dictatorship — to the broad indifference of the European Union. In the absence of concerted international pressure on Turkey to rein in Erdogan’s megalomaniacal authoritarianism, the only plausible outcome is further and much more extensive violence. Francis O’Connor is a Germany-based researcher from Ireland. He completed his PhD at the European University Institute on the Kurdish struggle in Turkey.